The year 1913 seems to have had a strange effect on educational language, and as yet, I haven't figured out exactly what happened. A few days ago, Dave Renfro, an internet associate who does more research into journals than anyone I have ever heard of, sent me a note that had an aside that said, "Also, ...,I've seen the terms "promiscuous exercises" and "promiscuous problems". I did a little follow-up and found literally dozens of books that use the phrase "promiscuous problems". My Google Book search on the exact phrase produced 71 books and journals, mostly referring to mathematics, but not exclusively. In glancing at the dates, I noticed that almost all were before 1900. So I set the same search with a cut-off of before 1900. The result?... There were still 25, but only five of them were after 1910. Of these five, one was about sexual disorders of bulimic patients and had nothing to do with problem sets of the educational sort, one was a catalogue of antiquarian objects and was referencing a phrase in an older object, two were reproductions of very old texts. That leaves the one final object after 1910 that referred to Promiscuous exercises in regard to problem sets, with a date of 1913. For some reason, the usage to describe a set of problems or exercises seems to have disappeared after that date almost completely. "consisting of a disorderly mixture of people or things," from L. promiscuus "mixed, indiscriminate," from pro- "forward" + miscere "to mix" (see mix). Meaning "indiscriminate in sexual relations" first recorded 1900, from promiscuity (1849, "indiscriminate mixture;" sexual sense 1865), from Fr. promiscuité, from L. promiscuus. So the term was essentially used for a general mixture, thus promiscuous exercises were a mixed review; but then in 1900 the phrase became associated with "indiscriminate in sexual relations" and apparently that usage became so common, that the use of promiscuous exercises was no longer classroom acceptable. Makes me think of a story that John H Conway, told (I believe) about the word hexagon. If you search the word "sexagon" you will see that it was very common in old math texts, then during the Victorian era, it became too suggestive for classroom use, and so hexagon, which also has a long history of use, became the preferred term. It started with an old (1848) journal article by JJ Sylvester on a property of concurrent lines in a triangle. He pointed out that if you had a triangle and located a point in its plane (I begin this with students by placing the point in the interior of the triangle) then the three cevians (lines from a vertex cutting the opposite side, perhaps extended) through the point will lie on a circle. He went on with some more detail, but ended the article by saying something about it being a good classroom exercise because it raises many good questions. It reminded me of all the quotes I have about the importance of "questioning" to being a good mathematician. I wonder if math teachers in general agree, and if you could tell they did by the way they run their classes? So if the art of asking questions is more important, should we be spending more time getting students to ask, rather than answer questions. I don't think I teach them to ask quesitons very well. My kids are good at asking, "How do I do that? ", but not at the kind of questions that develop and reinforce intuitive development. I think I model asking questions well... "what might happen if we changed this? What does this remind you of??? ", etc...but I don't have any activities that actually are designed to help them learn to ask good mathematical questions. So do you do that? And how do you do it? Mathematician Steven Strogatz shows how flocks of creatures (like birds, fireflies and fish) manage to synchronize and act as a unit -- when no one's giving orders. The powerful tendency to synchronize even extends into the realm of inanimate objects? Carnival 51--- back from the "near dead"
The 51st Carinval of Mathematics is back, alive and, hopefully, well. Go by and check it out at Square CircleZ. One of the nice ones at a site I had not seen before was a Facebook for numbers example at Math Nuggets which looks like a blog I will need to explore more in the future. I also really enjoyed Aspects of a Topic by Vlorbik, who makes a really good argument for doing arc length with parametric functions... how come I never get these kinds of good ideas???? They even had a link to my blog on Benford's Law (blush). During the same week I was introducing the conic sections in Alg II, I came across this old Ted talk about ... well, about all the stuff I mentioned above... I found it pretty interesting, and hope you will as well. The Ted site describes it this way: "Margaret Wertheim leads a project to re-create the creatures of the coral reefs using a crochet technique invented by a mathematician -- celebrating the amazements of the reef, and deep-diving into the hyperbolic geometry underlying coral creation." If you looked in lots of reference books and found the areas of all the lakes on the Earth, about 30% of the numbers you would find would start with a 1. It doesn't even matter if some of the books gave area in square miles, others in hectares, and still others in square meters. This is one of the surprising results of Benfords Law. The same result would occur if you found the daily sales for all the McDonald's franchises in the world, and again, it doesn't matter that some are in dollars and others in yen. The law is named for US Physicist Frank Benford who published a description of the effect in 1938. As you might have guessed, someone else did it earlier; a half century earlier. In 1881 a note to the American Journal of Mathematics by the great American astronomer, Simon Newcomb, described an unusual observation. He had noticed that the tables of logarithms that were in common use back then by astronomers, always had the pages of the lower numbers more dog-eared than the pages of the higher numbers. He suggested that natural observations tend to start with the number one more often than with an eight or nine. For some reason, the observation went without much comment. Years later Benford published data from an assortment of different areas, and the mathematical quirk of nature now bears his name. No reason was given for the unusual distribution until 1996, when Theodore Hill of the Georgia Institute of Technology published, what else, Hill's Theorem. There is even a formula for how the distribution works. According to Benford's Law, If you take a large data sample from a collection of non-random but wide ranging data, the percentage starting with the digit d will be log(1 + 1/d) where the base ten log is intended. Since log(2) = .301 we estimate that 30% of the numbers you will see on the internet in a day start with 1. Log(1 + 1/2) or approximately 17.6% start with two and each larger digit becomes a little less common with a little less than 5% of all numbers starting with nine. 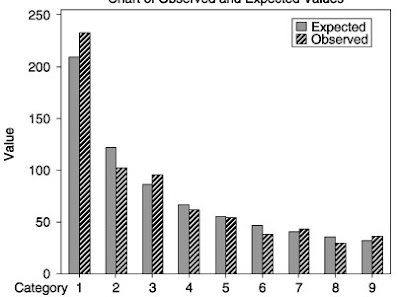 There does not seem to be a clear and definite rule about what kinds of data seem to obey Benford's Law, but in general, data coming from a wide range of statistical distributions seem to apply; so if you recorded all the numbers you encountered on the internet today, the first digits should probably follow Benford's Law. You can find more in this article about the law from this article by Jonathan R. Bradley and David L. Farnsworth of the Rochester Institute of Technology. The roundest knight at King Arthur's round table = Sir Cumference. Atheism = a non-prophet organization. WWI soldier who survived mustard gas and pepper spray = a seasoned veteran. cannibals eating a missionary = a taste of religion. joining dangerous cults = Practicing un-safe sects! It is one of the most beautiful idea of mathematics. Indeed, David Richeson has written a new book in which he calls the theorem "Euler's Gem", and truly it is. You can see the book, and order it,here. Euler was such a prolific mathematician that there are many theorems that bare the name “Euler’s Theorem.” In this short article I will sometimes say “Euler’s Theorem” when I mean the particular theorem that shows that for all connected planar graphs (on a plane or a sphere), the number of vertices, v; edges, e; and faces f; obey the simple relationship v+f=e+2. Student’s are often introduced to Euler’s Theorem as early as seventh or eighth grade, but almost always in a way that leads them to intuit the result. They are seldom shown, or asked for, a proof of the theorem. Since it forms the foundation for the proof of several other topics that students are introduced to in discrete math classes, I wanted to illustrate one proof here that I believe is understandable to most high school students. We begin with a simple statement that is easy to prove. All connected trees meet Euler’s Theorem. First, since there are no cycles in a tree, the total number of faces is one, f=1. Now start with a single vertex and no edges (perhaps we call this the “seed” of a tree, or a proto-tree. There is one face, one vertex, and no edges, so clearly v+f=e+2 is satisfied. Now what do we do to make the tree more complex? Well, we add edges; but each new edge begins at some existing vertex, already counted, and extends to some new vertex not yet counted, thus increasing edges and vertices by one and continuing. If the edge went between two existing vertices it would complete a cycle. So if we add n edges, we have to add n vertices to connect them to, and there is still only a single face. For a connected tree, then, it is always true that v=e+1 and f=1 and so v + f = e+1 + 1 = e+2 and the theorem is confirmed again. But Euler’s Thm is NOT about trees, it is about all planar graphs and they might, and usually do, have cycles. Next we just show that any planar graph can be pruned to make it a tree without changing the relationship between edges and faces. 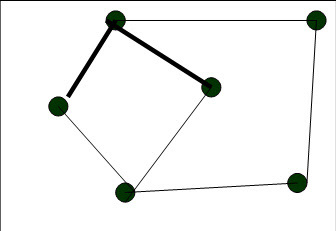 In the figure at right we show a planar graph with six vertices, three faces and some edges (we ignore how many for now). Pick any of the edges and remove it. What did you do to the number of faces? What did you do to the number of edges? Now continue to remove an edge that is part of a cycle. The net result is a simple connected tree for which with one face, v vertices, and v-1 edges (because it is a tree). If we removed n edges from the original graph, then we must have removed n faces, and so the original graph had 1+n faces, v vertices, and v-1+n edges. We check to be sure, and v+(1+n) = (v-1+n) +2 and simplifying we see that Euler’s theorem is also true for the original graph. But since any such planar graph can be reduced to a connected tree by the same method, then all planar graphs obey Euler’s Theorem for Planar Graphs. Ok, Just had a great "time out" week in the North of France walking the beach and eating too much good seafood and pizza with my beautiful wife... no internet and it gave me time to read some interesting old articles from the 1840's and a few books I had around that I hadn't gotten a good look at yet... and think... what a great idea...just time to think.... A couple of articles will show up in the next few blogs... some history notes from Augustus De Morgan and a nice geometry article that got me thinking about something we DON'T seem to do with kids that we all seem to think is important... but today... Time for a little more relaxation... back soon though, I promise. Teachers (and students) at all levels of math should note that the fourth "Math Teachers at Play Carnival of Blogs is at Homeschool Bytes Drop by and check it out. 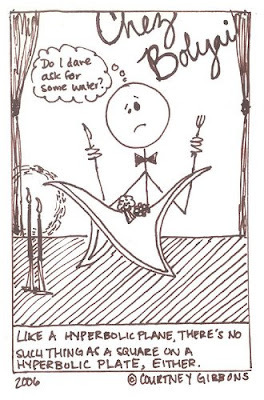 It's the last day before Spring Break for my calc kids, and the time of year when we begin trying to brush up on all those ideas from first semester that slipped out of our memories, or things like related rates and implicit derivatives that never quite settled for some. This year I told them I would post a list of helpful sites here that included some video lectures on specific topics and more traditional textbook type stuff. The first is called Just Math Tutoring and it has a set of calculus videos focused on particular topics. They lok pretty good. The second is from MIT and is labled Calculus for Beginners and Artists Not sure what that implies, but they have some good written lessons, and some nice java applets for slope fields and such (look under ordinary differential equations) as well as some other nice interactive stuff. Then there is the Midnight Tutor, almost certainly a referrence to when they get their desparate crys for help. These guys will, apparently, let you send them a question and if they don't have a video solution already, they make one... do NOT call Mr. Ballew if they fail to produce. And finally, if you really dig MIT stuff, there is an online one variable calculus course that has a lot of the same great stuff as the other MIT site. Now turn off Facebook or My-space and go to work... down to five weeks to go... FIVE??? ... remember in September? You talked about that five... now is the time to work on making it happen. No music, no TV...just calculus. I just had someone call my attention to a link with calculus video lectures done by Selwyn Hollis, who was called "a truly excellent expositor". He even has links to Ipod and iphone... take calculus to the beach?